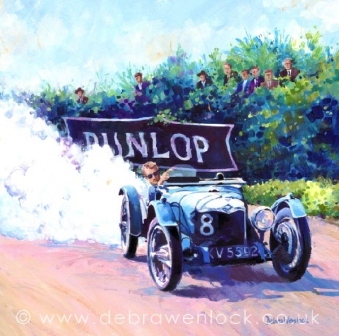 Riley owner Debra Wenlock is a member of the Guild of Motoring Artists who paints all manner of subjects but has a passion for cars and motoring - see her website here for her whole range of paintings, prints and cards Debra Wenlock. 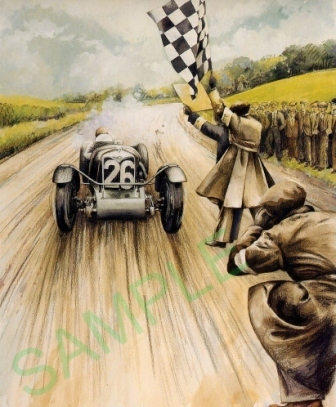 Here are some examples of her work, some from Ards but other locations as well, for more detail on the Ards TT look here 1928-1936 RAC Tourist Trophy. .
Below - CR Whitecroft drives his Riley to victory in the 1932 TT and poster celebrating the 75th anniversary of the race by the Riley Ulster Club. 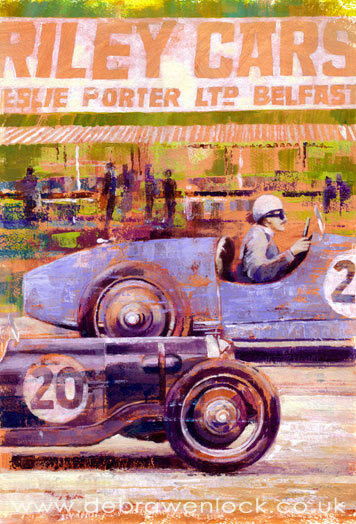 Below - Victor Gillow and Freddie Dixon passing the pits in the 1932 Ards TT. 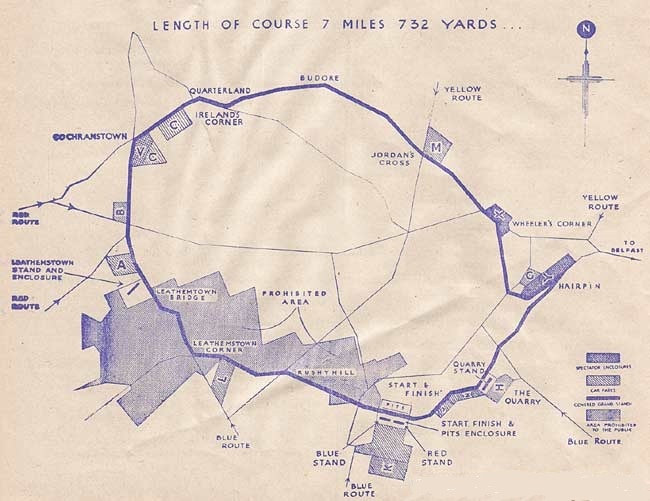 Below - George Easton and Cyril Whitcroft round Dundonald hairpin in the 1933 Ards TT. 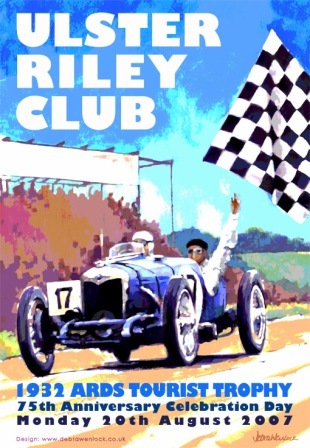 Below - Freddie Dixon's Riley - winner of the 1935 RAC Ulster Tourist Trophy on the Ards Circuit. 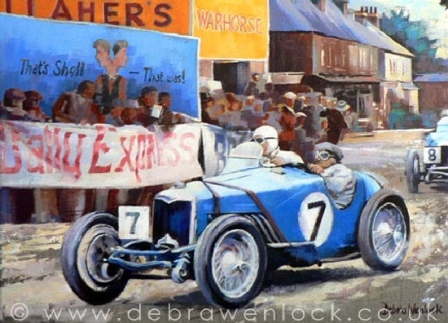 Below - Freddie Dixon and Charlie Dodson shared the driving to win the last Ards TT in 1936. 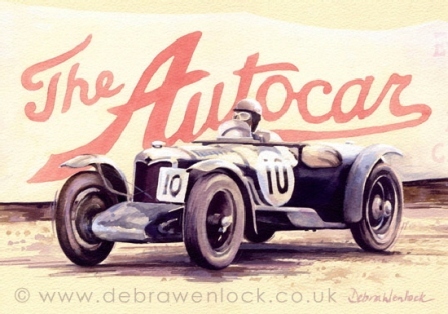 Below, some original pictures from Dr Birmingham's book "The production and competition history of the pre 1939 Riley motor cars. 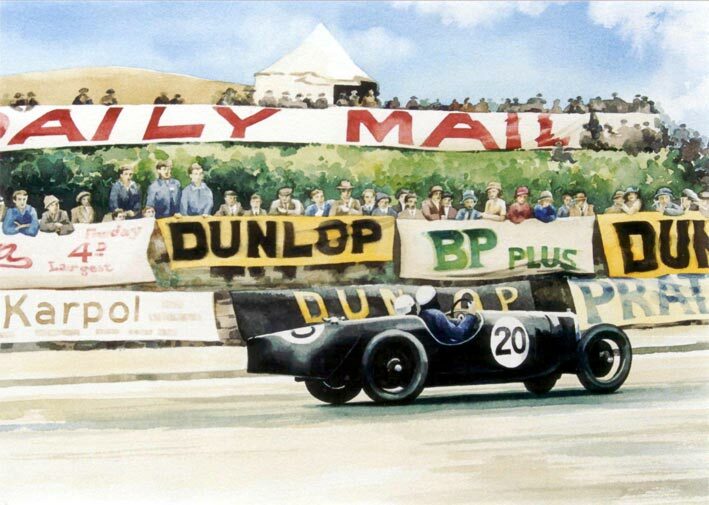 Below - Freddie Dixon's long low Riley special cuts a fine dash at the 1935 Mannin Beg race on the Isle of Man. 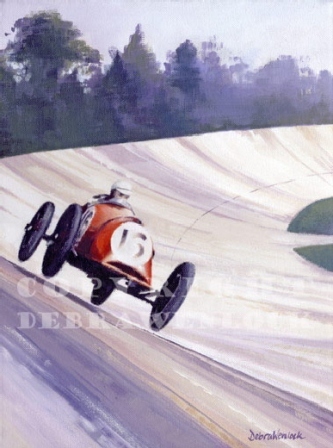 Below - Freddie Dixon's Riley single seater special "Red Mongrel" scorches round the banking at the 1933 500 mile race at Brooklands. 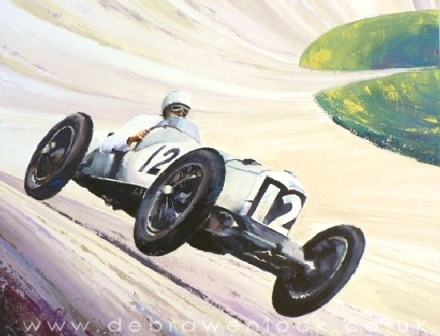 Below - Freddie Dixon's Riley flies round the banking at Brooklands. 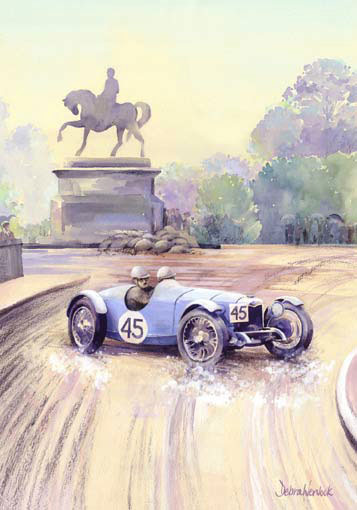 Below - Victor Gillow's Riley slides into the corner at the Gough monument before winning the 1930 Saorstát Cup. 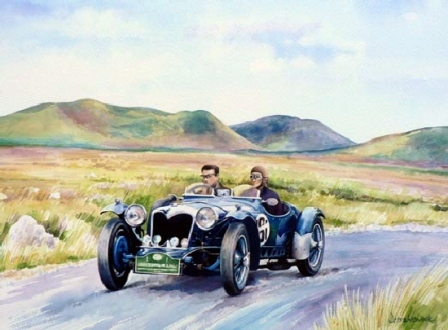 Below - Riley Brooklands Nine ascending Craigantlet hillclimb, County Down in 1933, driven by AH Wilkinson. 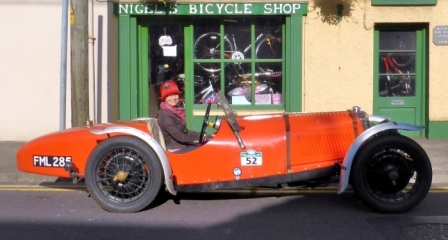 Below - Debra in her Riley. 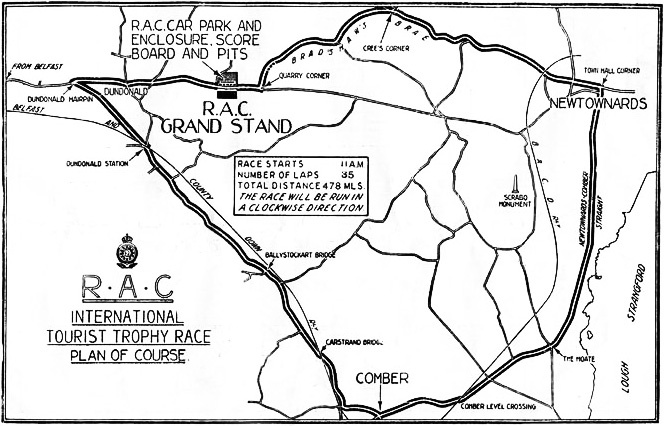 Below - 2 versions of the Ards TT circuit map (1928-1936), the one on the left kindly supplied by Barry Kirkwood, the one on the right a R.A.C. version. 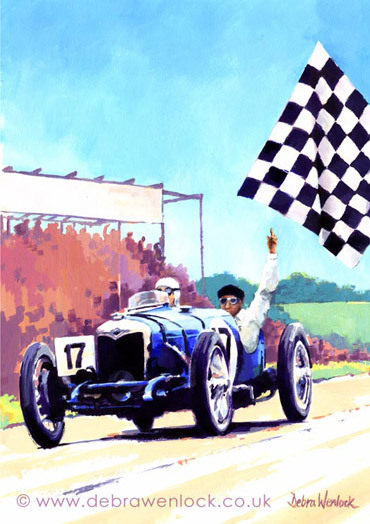 Barry has writen an interesting article for "Model collector" magazine, June 2018 issue, showing many diecast models that raced at Ards. 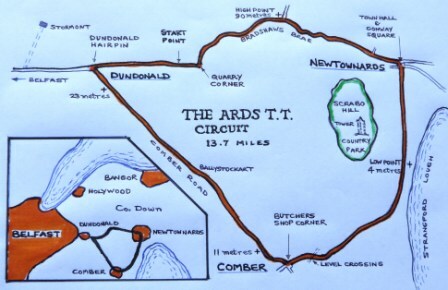 Below - after a serious accident in September 1936 the Ards races were discontinued but the TT returned to Northern Ireland between 1950-1955 at the Dunrod Circuit below.